The US Nasdaq Composite index passed the 5,000 point mark for the first time in 15 years on Monday close, reflecting the growth of such tech giants as Apple and Facebook which have seen profits triple in the last six years. The Nasdaq rose by 0.9 percent to 5008.10 points, with shares in Apple, the biggest US company by market capitalization, adding 0.71 percent and Facebook up by 0.96 percent .The internet retailer Amazon.com added 1.19 percent. The Dow rose 155.93, or 0.86 percent, to 18,288.63, while the S&P 500 advanced 12.89 (0.61 percent) to 2,117.39. Talking about the record climb of the Nasdaq index, analysts recall the dot-com bubble of 2000 that saw meteoric rises in stocks of internet companies which eventually led to it bursting and an 80 percent fall in the Nasdaq. Unlike in 2000, the current rush revolves not around the expectations of a rising market, but is caused by a real market boom, as the value of hi-tech companies is increasing rapidly. “The difference between Nasdaq today and Nasdaq 15 years ago is many of the strongest companies in the Nasdaq have had good earnings and are not at stretched valuations,” Michael Strauss, chief investment strategist and chief economist at Commonfund Group in Wilton, Connecticut told Bloomberg. “You don’t have the stock frenzy of 1999, 2000. Stocks are much more rationally priced for many sectors,” he said. 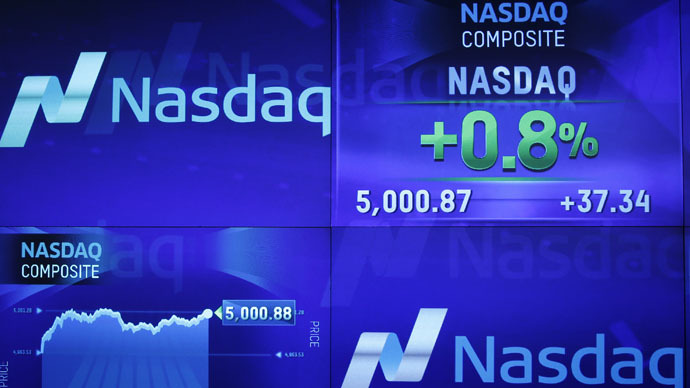 After reaching its all-time record of 5,048.62 on March 10, 2000, the Nasdaq went through a series of tailspins. The index fell more than 20 percent in just a month and lost nearly 80 percent before it started a recovery in October 2002. It took years for the Nasdaq to climb back to 2,500 when the 2008 financial crisis inflicted another blow on the market. The stable recovery of the Nasdaq index started in March 2009 and it’s currently up more than 300 percent, outpacing the S&P 500 index and the Dow Jones Industrial Average over the same period. At the same the real indexes of the US economy show growth in the personal income of Americans in January 2015 remained unchanged at 0.3 percent, while analysts expected it to increase by 0.4 percent. The rate of decline in personal spending among US citizens decreased to 0.2 percent from 0.3 percent in December, while experts predicted a decrease in costs by 0.1 percent.